Thousands of dismissed workers at Anglo American Platinum Ltd.’s (Amplats) mine in Rustenburg have still not accepted an offer to reinstate them, the world's largest producer of the metal said on Thursday. "The offer was strictly subject to all striking employees returning to work and doing actual work activities by no later than Tuesday, October 30 2012," the company said in a statement. 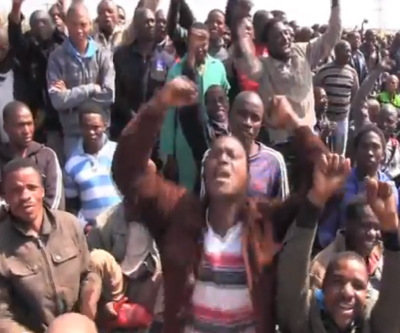 Amplats said it was extending the deadline not only for its Rustenburg workers, but also for employees from two other operations, but the fired miners demanded pay increases as a precondition for complying. Tension is high around the Rustenburg mine. On Tuesday, police dispersed a group of around 1,000 protesters with rubber bullets and tear gas, as they blocked roads with burning tires and threw rocks at passing vehicles. So far, the company has lost 141,640 ounces of platinum production since strikes starting in mid-September halted more than a third of its capacity. Last week, the platinum producer said it met with unions to facilitate the return of the 12 000 dismissed workers and those who were on an illegal strike at its Union and Amandelbult mines. In related news, Amplats also said Thursday that it has agreed to transfer majority of its Unki mine in Zimbabwe to locals, following pressure from President Robert Mugabe's government. The transaction values the 51% stake at almost $143 million. Anglo Platinum is the last large miner facing strikes after a wave of labour unrest in South Africa that cut gold, platinum and iron production since early August, costing the country’s mining industry billions of dollars of lost revenue.